If there’s a lesson to be learned from Monica Manotas’s career, it’s that engineering and finance are a winning combination. Manotas came to Simon after earning a BS in Industrial Engineering in Colombia. 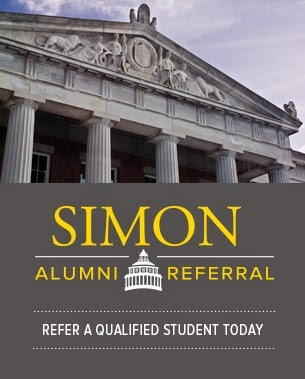 She chose Simon for its reputation in finance and analytics and because she felt her engineering studies left a gap in her understanding of finance. While studying at Simon, Manotas was hired by Fisher Scientific, now Thermo Fisher Scientific, as a summer associate. She notes that she got great visibility to top management at Fisher, which was a solid base for networking. “I still use my Simon network today, and I credit my network of alumni, professors, and staff with teaching me the importance of discipline in the job search process,” she says. Manotas has been with Thermo Fisher Scientific since 1999 in various capacities, including stints in Spain and Switzerland. While there, she has moved up in diverse company sectors to obtain her current position near Boston, where she’s vice president and general manager for growth, protection, and separation products. “I’m responsible for the centrifuge, bio-safety cabinet, CO2 incubator, and orbital shaker lab equipment product lines, which have a global market,” she says. “Thermo Fisher has been growing rapidly both organically and through acquisitions,” Manotas notes. “I’ve learned a lot about how people respond to change, how culture affects business interactions, and the importance of well-timed decisions,” she says. 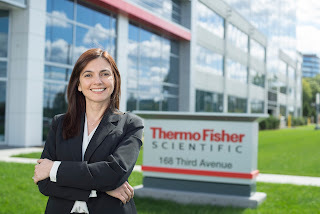 It gives her great pride to combine the Thermo Fisher identity with the knowledge and experience of acquired businesses to further the company mission of enabling its customer to make the world a healthier, cleaner, and safer place. Manotas learned as much in the classroom, she says, as she did from outside interactions while at Simon. “I met some great people and loved the parties, especially the Blackjack Ball and LASOS events,” she notes. She was particularly influenced by Mike Barclay’s corporate finance expertise and considers his untimely death in a seaplane accident a tragic loss.